What a bumper crop of petite Treat’s we have had this month for Treat Petite. Spring Into Easter certainly got those creative juices flowing. 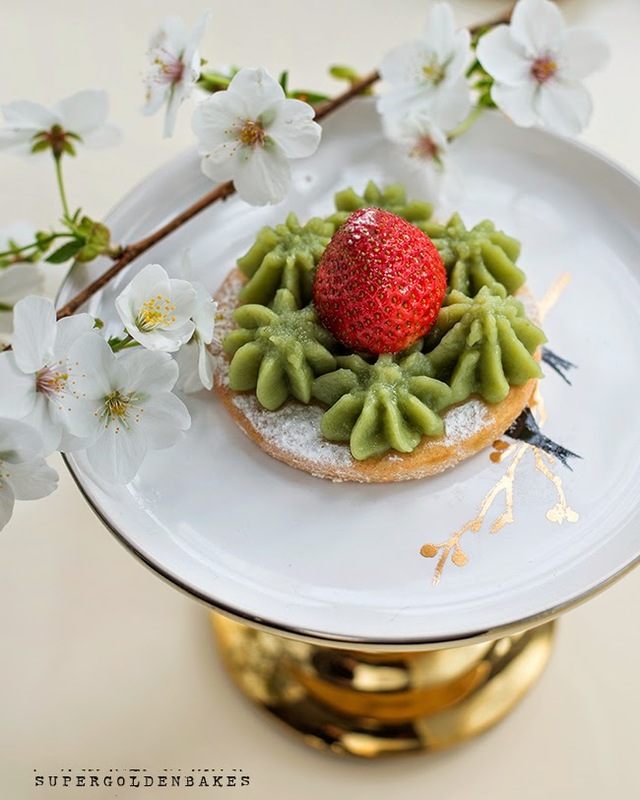 Our first entry was from Lucy at Supergolden Bakes who made Strawberry Tartlets with Matcha Pastry cream. She was sent some green tea powder which she made the pastry cream from and was going to make mini-cakes for Mother’s Day but work got in the way. She made these instead – lucky mum! Secondly was Angela at My Golden Pear who entered her very fun looking white chocolate mousse eggs. She had recently made chocolate coconut mousse, but wanted to try it with white chocolate instead and she served it up in little hollow easter eggs. They look cracking! Ros, The More Than Occasional Baker made these delicious looking Peach and Blueberry Maple Syrup Muffins. Those three ingredients right there just sound perfect for breakfast, and the wholemeal would make me feel very healthy indeed! 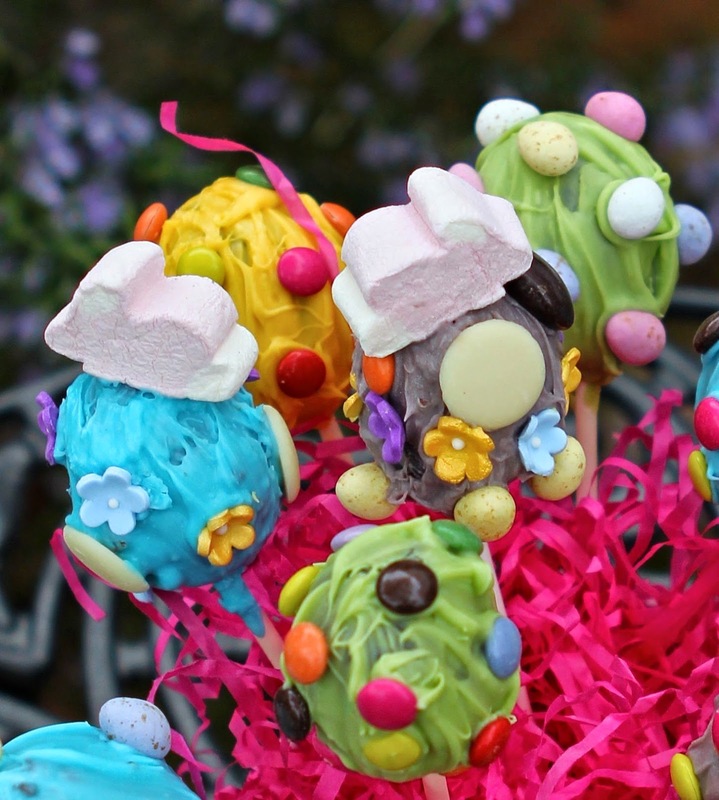 Kate – the Gluten Free Alchemist, made these rather vibrant looking Easter Egg Pops from a frozen chocolate sponge in her freezer and some candy melts. Kate wasn’t too happy with the outcome but I think they look really fun. Another Easter breakfast treat from Ros, The More Than Occasional Baker were these mini chocolate and peanut butter croissant. I love PB in anything, so these were a hit for me. 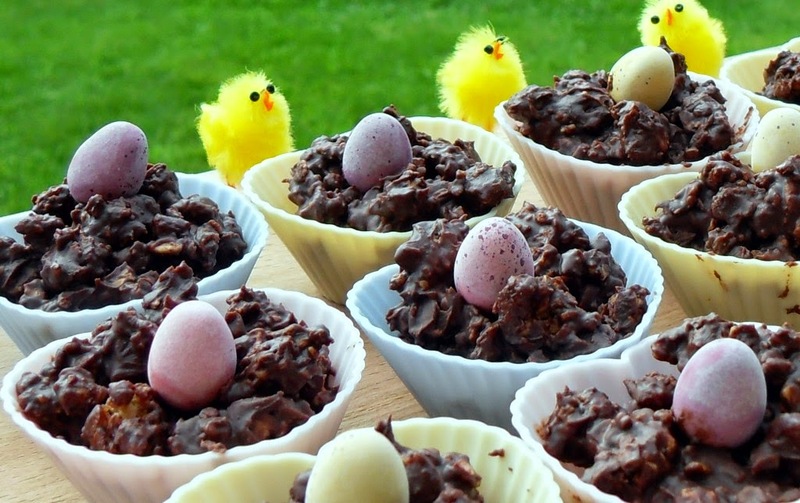 Camilla at Fab Food 4 All entered these Easter Chocolate Granola Cakes. 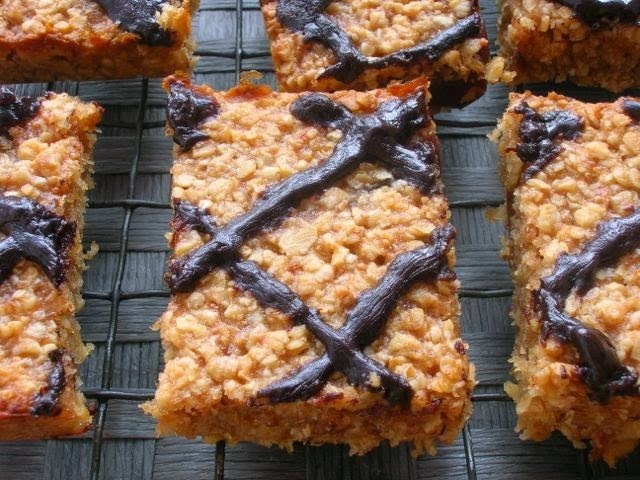 A twist on a classic, Camilla made these with maple and pecan granola cereal and dark and milk chocolate. All these flavours together sound so good. Laura at How to Cook Good Food actually sent these Hot Cross Buns with lemon, rosemary and white chocolate to Kat at the Baking Explorer, who forwarded them on. And I’m glad she did as it’s another flavour combo I would never thought of but would like to try – lots. 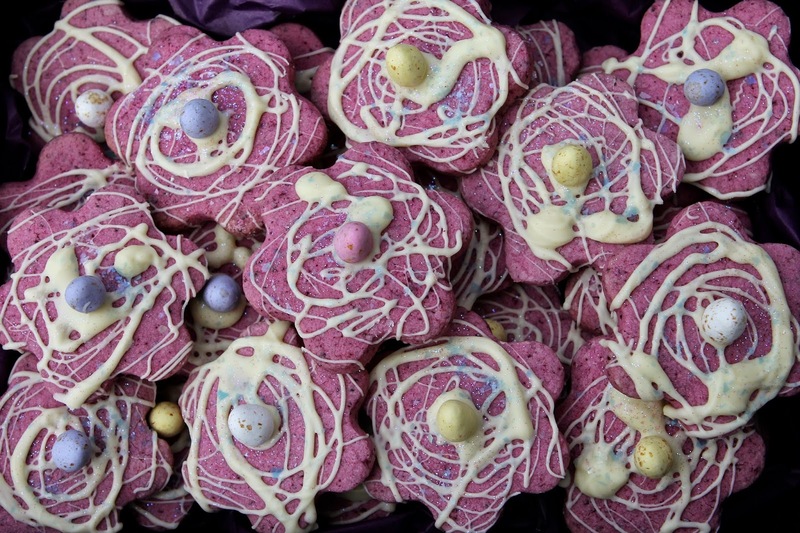 Kate – the Gluten Free Alchemist also entered these gluten free Blackcurrant Flower Biscuits. Made with freeze-dried blackcurrants, these biscuits look vibrant and very spring like. Apparently they are like eating Ribena, how bad can that be?! Ros, The More Than Occasional Baker also sent in her chorizo and manchego cheese hot cross buns. How original and scrummy do these sound? Ros made these for a competition I also entered. Sadly neither of us won, but Ros really should have with this savoury concoction. Helen from Family-Friends-Food celebrates Passover rather than Easter and asked if it was okay to submit a Pesach recipe. Her no-bake chocolate coconut balls contain no wheat flour which isn’t allowed during Passover. They look nice and rich and a perfect entry for Treat Petite. 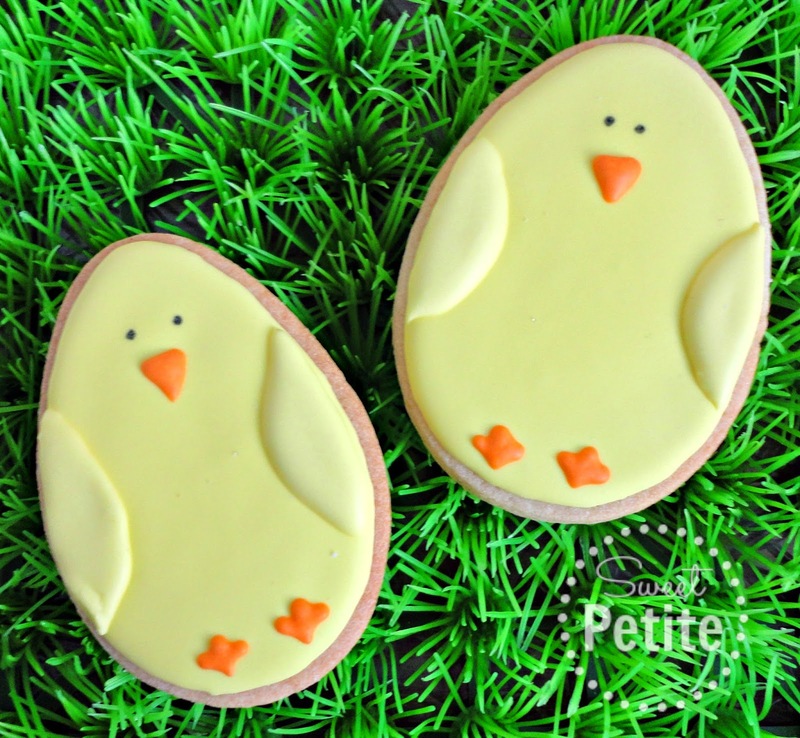 Shel at Sweet Petite submitted her Easter biscuits. Shel’s creations show she is a very talented baker and decorator. They are super-cute and very festive. 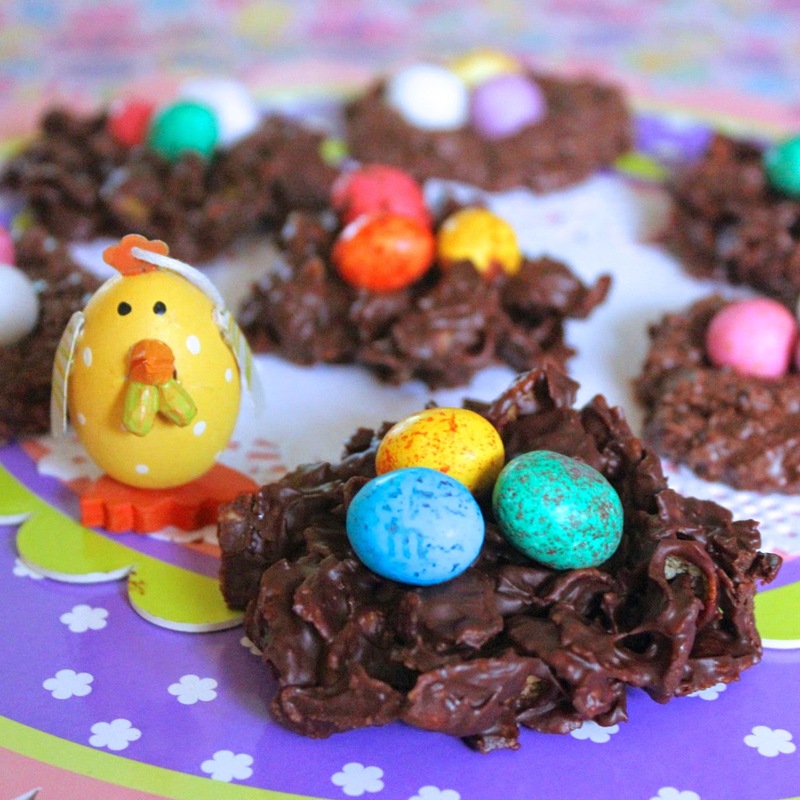 Pauline at Pauline’s Occasional Baking Adventures entered her Easter Chocolate Cornflake Nests. Pauline had never made these before, but was making them for a quick charity bake. I’m sure they raised lots of dosh! 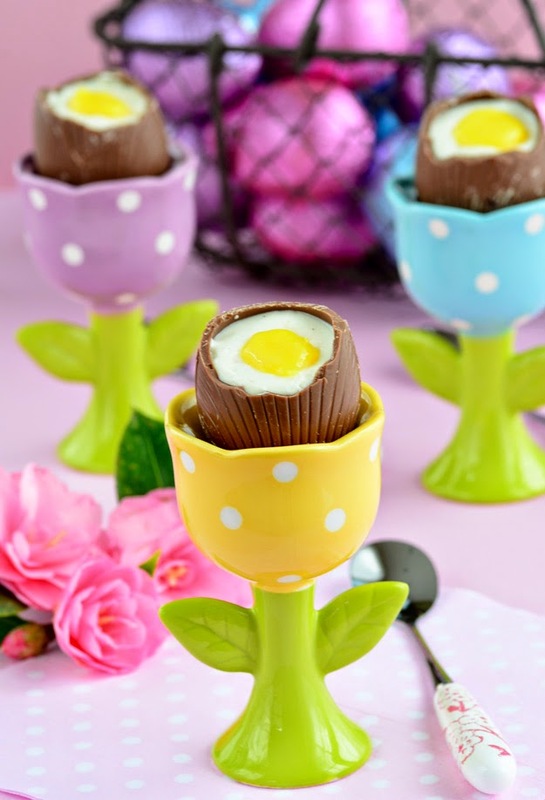 Ros, The More Than Occasional Baker also entered some Chocolate Easter Egg Nests. These bring back so many memories from my childhood and are such a classic. Johanna from Green Gourmet Giraffe entered her Easter Chocolate Egg Nests too. She bedecked hers with M&M Speckled Eggs. Haven’t heard of them in the UK? Johanna is from Australia where they are available. 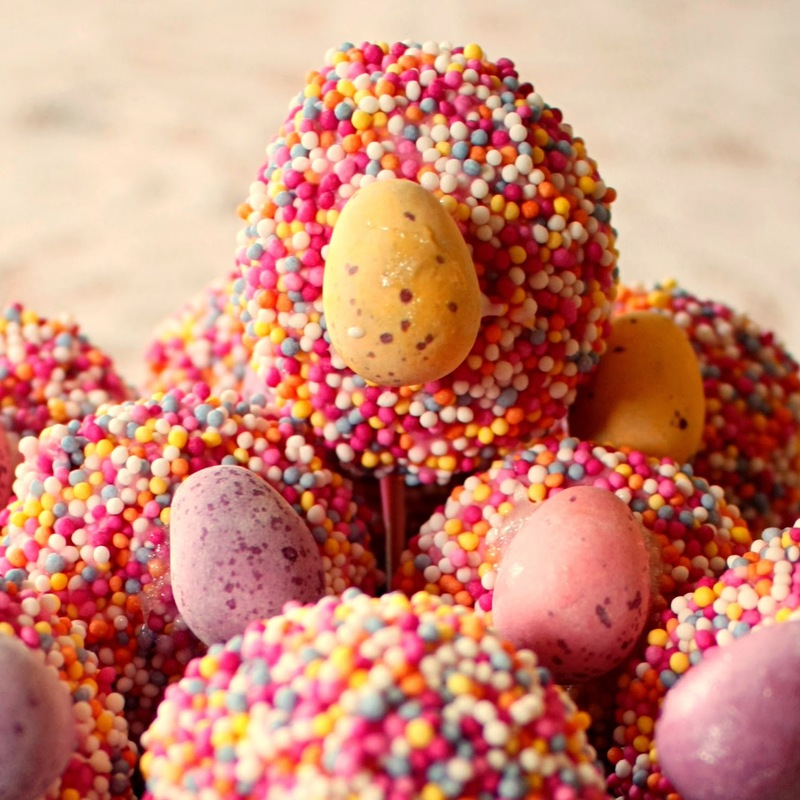 They look very nice and are a nice difference to the mini eggs. Ness at Jibber Jabber UK entered her Easter Simnel Cupcakes. Ness usually make a whole Simnel cake, but this year went for cupcakes. The cupcakes, like the cake, feature eleven marzipan balls, each representing one of the apostles. Judas didn’t get one, so Ness decorated the twelfth to symbolise Jesus. Helen at Family-Friends-Food also entered her coconut cupcakes with raspberry apple syrup. The ingredients mean this bake is suitable for Passover and they really look lovely drenched with the raspberry apple syrup. I also loved the little cupcake cases which Helen says she picked up in one of my favourite stores – TK Maxx. Ros, The More Than Occasional Baker must be exhausted as she had time to enter another delicious bake – Chocolate Easter Eggs with a twist. The twist is that the cakes are baked into eggshells. The shells are then peeled off to reveal egg shaped cakes. How ingenious is that?! 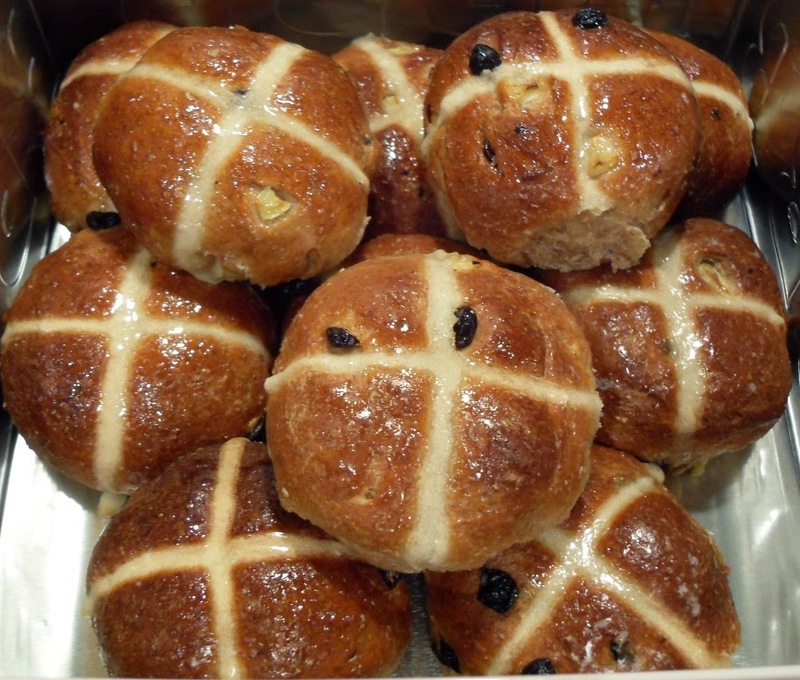 Jen at Blue Kitchen Bakes made lovely light looking white chocolate and cranberry hot cross buns. She added her own speculoos spice mix to these. As you may remember, I have an addiction to speculoos (or biscoff as it’s being called these days), these are a huge winner for me! 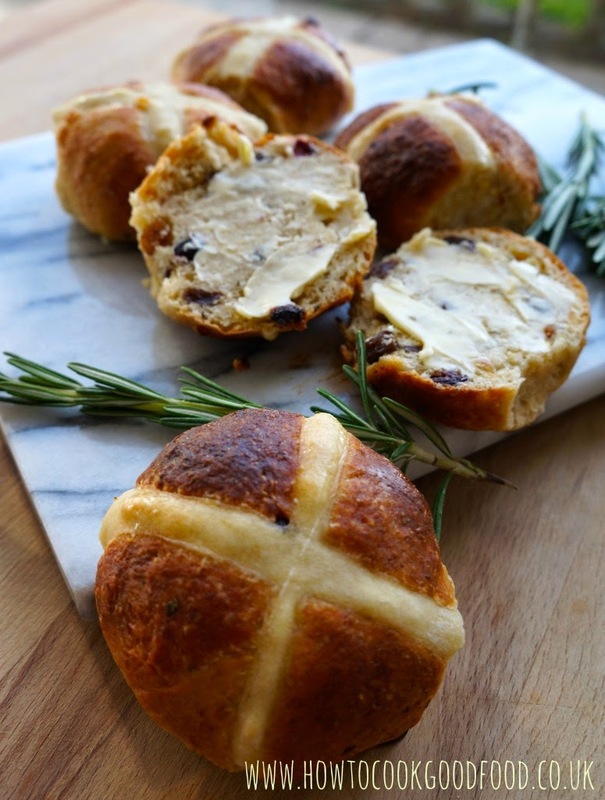 Camilla at Fab Food 4 All also entered these gorgeous Wholemeal Apple Hot Cross Buns - she stayed up 'til one in the morning perfecting these beauties! Laura over at I’d Much Rather Bake Than… entered her Peanut Butter White Chocolate Rocky Road Cake Pops. All of these ingredients sound like heaven to me. Laura made them after being sent some baking goodies from Renshaw. 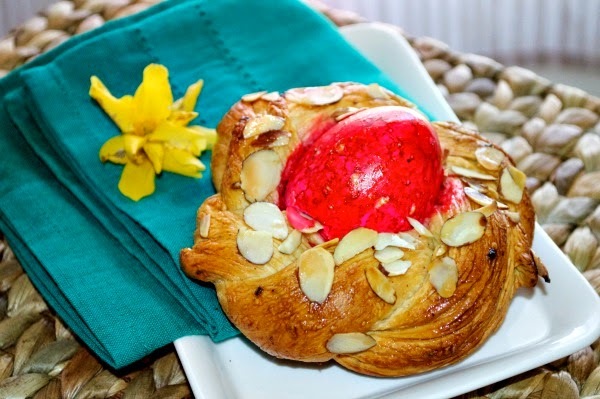 Emily at Cooking for Kishore entered her Greek Easter Dessert Bread or Tsoureki. I have seen plenty of Italian Easter Bread about this year, but this is the first Greek one I’ve seen. The bread is flavoured with allspice, caraway seeds, cinnamon and star anise so would pack a spice filled punch. Red dyed hard boiled eggs are added to the plait before baking, making for a stunning loaf. Tina over at The Worktop entered her Strawberry Banana Mini Pie Bites. 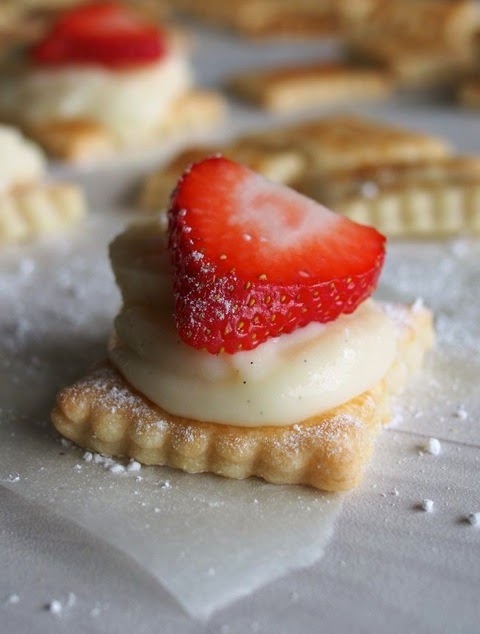 These are so incredibly cute, they consist of a square of shortcrust pastry, topped with pastry cream, banana and strawberry. Tina explains about grocery items she can't find on the supermarket shelves here in the UK, which she used to get in her native LA. Choclette over at the Chocolate Log Blog entered her deliciously Jammy Flapjacks - they contain some of her fig, apple and pomegranate jam. And the added Eastery bonus was the chocolate on top which was left over from her Easter bundt cake. Kat my Treat Petite co-host entered her Crème Egg Cupcakes. A crème egg is actually baked in the middle of these chocolate cupcakes and then topped with half a mini one. Crème egg overload has never looked so good! And as for myself? 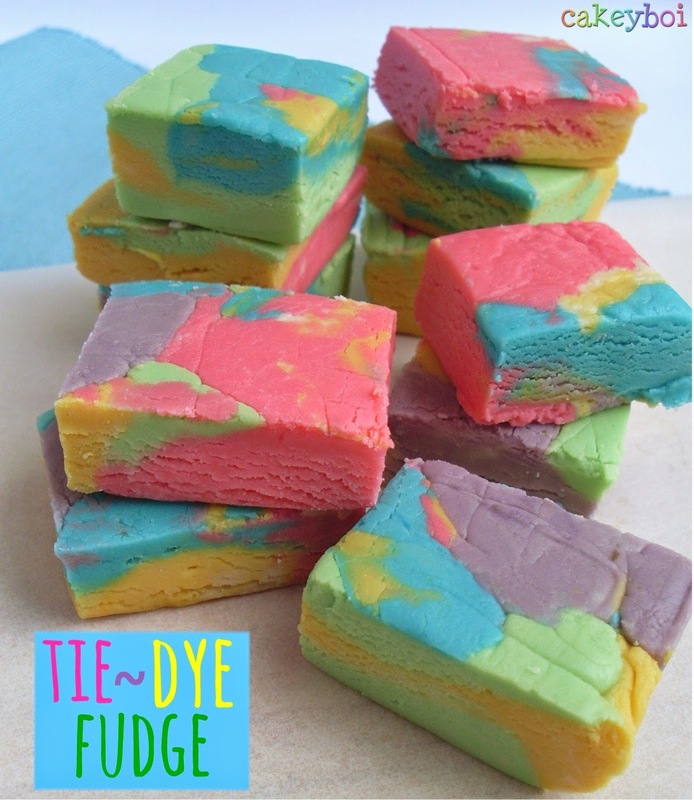 I entered this Tie-Dye Fudge into Spring into Easter. The vibrant colours just scream spring to me. The easy to make fudge tastes just like white chocolate and was a huge hit with everyone. Thanks to everyone for Springing into Easter this April. 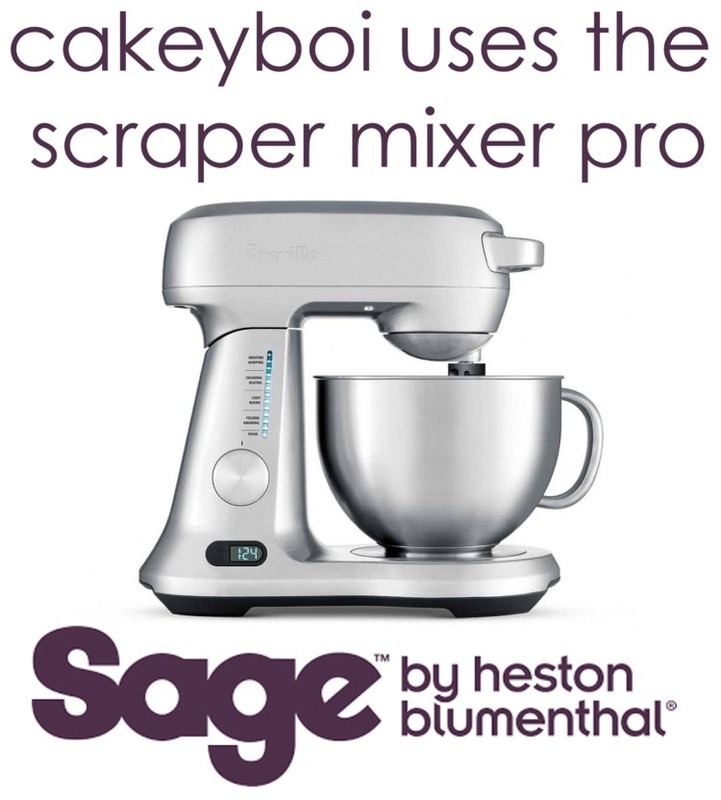 Check out The Baking Explorer for May's Treat Petite soon. And congratulations goes to @T18LIsaa who won the Sainsbury's Cake Book. The book will be on it's way shortly! Wow what a load of Easter deliciousness! :-) They all look absolutely scrumptious. Aren't there a lot of very creative people out there?! Great selection of Easter treats! thanks so much for letting me join even though it wasn't technically a bake ;) Wow! There are some talented people here! Thanks again! A lovely array of treats here thanks for a fab round-up. Did my Wholemeal Apple Hot Cross Buns get lost in the post? Slight Google Mail hitch, but added now Camilla. Apologies!